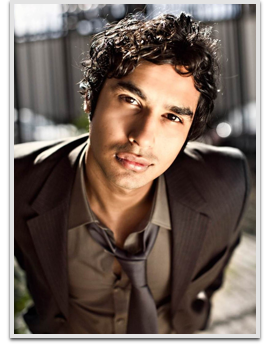 Kunal Nayyar first gained attention in the US for his role in the West Coast production of Rajiv Joseph’s 2006 play Huck & Holden, where he portrayed an Indian exchange student anxious to experience American culture before returning home. In 2006, Nayyar teamed up with Arun Das to write the play Cotton Candy, which premiered in New Delhi to positive reviews. Nayyar made a guest appearance in the CBS drama NCIS in the episode “Suspicion” (season 4, episode 12), in which he played Youssef Zidan, an Iraqi terrorist. Nayyar’s agent heard about a role for a scientist in an upcoming CBS pilot and encouraged him to audition for the part. This led to his casting in the sitcom The Big Bang Theory, on which he plays astrophysicist Rajesh Koothrappali. As of 2012, he is working on his first movie, Dr. Cabbie, in which he will be opposite Indian actress Katrina Kaif’s sister, Isabell. He has completed the shooting of his upcoming film Dr. Cabbie in Toronto, Canada. It is being produced by Bollywood actor Salman Khan. That same year, Nayyar voiced Gupta in Ice Age 4: Continental Drift.